We were recently contacted by OEM Pet Care to trial and review two of their formulas of dry dog food. 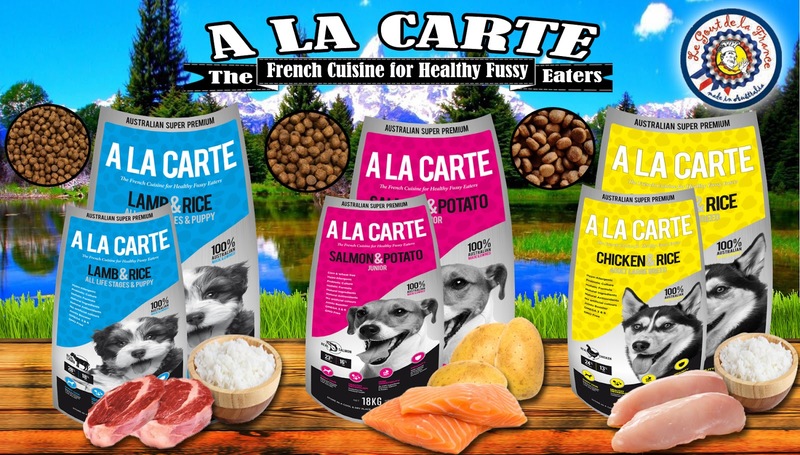 I must admit that we were not familiar with their A La Carte brand, probably because it has been predominantly targeted at the breeders’ market but it is now also sold to dog owners directly or via stockists. Although quite unknown to the general public, OEM Pet Care has been producing “value for money” dry kibble and canned food (for both dogs and cats), pet treats and grooming products for over 20 years. 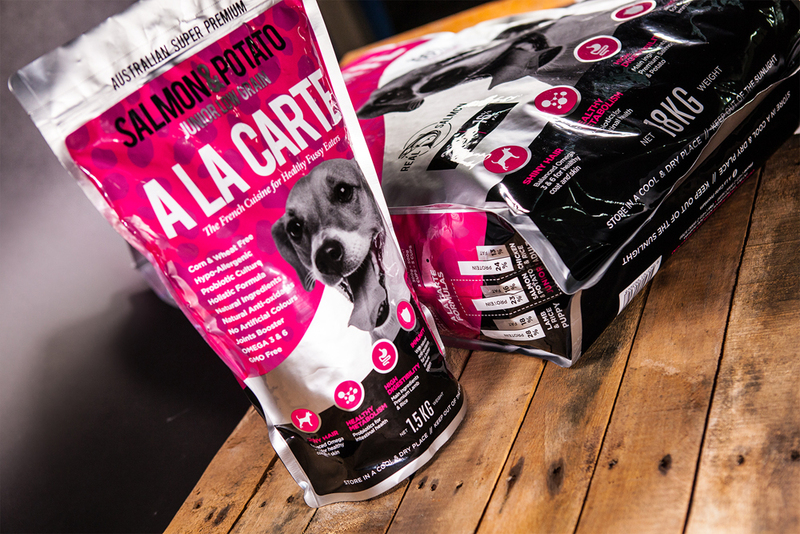 We received a sample bag (1.5 Kg) of the Premium Salmon & Potato recipe, which is aimed at junior dogs as well as a sample of the Lamb & Rice aimed at puppies (this is reflected in the much smaller size kibble). For large breed dogs or multi-dog households, all recipes are available in a much more practical (and economical) 18Kg bag. The entire range is recommended for all fussy and active dogs (all breeds) or those with sensitive skin. All recipes meet AAFCO standards and use high-quality named ingredients and also include a range of essential vitamins, minerals and anti-oxidants. Based on the recommended feeding guidelines (360g daily for a 30Kg dog), we tested each formula with two of our dogs for two days, which in all honesty is too short to draw long-term conclusions on its health benefits. Pet nutritionists always recommend to make gradual changes to your dog's diet and introduce any new food over a period of 5-7 days. However despite the limitations of this trial, we found that both dogs happily tucked in (there was definitely no issue with palatability!) and both recipes were very easily digested (no vomiting or diarrhea). Salmon Meal is the first named ingredient and constitutes the majority of the 23% protein contained in this kibble. Our dogs have been fed grain-free salmon formulas for many years and we always found this protein to be very easily digested, especially by our Malinois who tends to have a very sensitive stomach. You will also find Sardine Meal listed as the 7th ingredient, which is also a quality source of protein. The next ingredient and the main grain is Pearled Barley, which is much more nutritious than the fillers found in most supermarket main-brand foods. Ground Rice and Potato are next and start to make this food relatively high in carbohydrates (which is fine if you have a very active or working dog). Faba Beans (also called broad beans) are a rather unusual ingredient in a pet food and I had to look this one up! Being high in protein and dietary fibre but low in fat, they’re also very healthy for your dog. Chicken fat is a great source of nutrients for dogs, and also a necessary source of energy. Alfalfa is another good ingredient and thought of as a "super-food". Flax seed is another great ingredient (found in many premium dog foods these days) which promotes a healthy skin and a shiny coat. Lacto Sacc is a probiotic deemed to increase nutrient absorption and is rarely seen in dog food. Naturox is a natural preservative used with fish meals, and a much better preservative than nasties like Ethoxyquin. We noted the addition of Glucosamine and Chondroitin, which are beneficial to maintain healthy joints. The other recipes (Chicken & Rice and Lamb & Rice) use Rice instead of Barley and both have a reasonable amount of quality protein. The Lamb & Rice recipe is higher in protein with 28% (essential for muscle development), which makes this formula ideally suited for growing puppies. 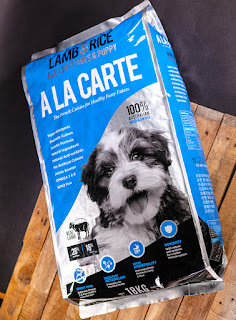 The Chicken & Rice formula is recommended for all large breed dogs from 12 months old and we found the larger kibble size was perfectly suited to our grown-up pack of Belgian Shepherds. The food is rich in real chicken, fortified with probiotics, glucosamine and chondroitin. RRP: $84.50 (Chicken & Rice Large Breed, Probiotic, All Life Stages - 18kg); $89.90 (Salmon & Potato Low Grain - 18kg). Free Delivery within Sydney metro area. Disclaimer: product gifted by OEM Pet Care for editorial consideration.